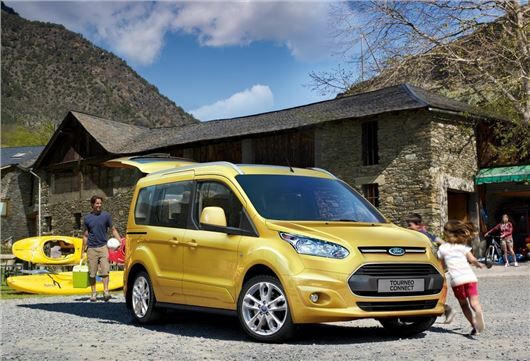 Ford has announced the prices and specs for its new range of Tourneo Connect MPVs. Prices for the five-seat Tourneo Connect start at £14,245, while the seven-seat Grand Tourneo Connect will set you back £16,985. The order books are now open, with deliveries expected from December. There will be two petrol engines available from launch – a 1.0-litre EcoBoost with 99PS and a 1.6-litre EcoBoost with 150PS – while Ford’s tried and trusted 1.6-litre Duratorq TDCi diesel will be available with either 95PS or 115PS. Customers will be able to specify a six-speed automatic or five-speed manual gearbox, and both trims feature gearshift indicator and Ford ECO Mode driver information systems as standard. Staying close to its commercial routes, the Tourneo Connect features dual sliding rear doors, along with flexible seating that will allow items up to three metres long to be carried. Ford is also promising a family friendly interior, with a melee of storage options, including aircraft-style overhead lockers and a scattering of cubby holes and cup holders. A large glass panoramic roof will also be included as standard. When is it to be released? ?